I have finally managed to get out and buy the sheet of MDF I needed to turn my oval dining table into a 6'x4' Dux Brit battleground. 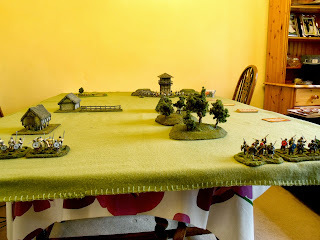 The dice roll called for a border watch tower, so the one I made here came out of the cupboard. Three big bits of terrain went into three areas (by dice roll, since I'm playing both sides it seemed the most sensible way), and four odd bits into the other areas. A roll determined the location of the tower, and a bit of jiggery pokery with the scenery followed to make it fit. While the official title is a raid on a border watch tower, the actual motivations are different. Aelle is raiding in the hope of capturing a British noble for ransom. Arthur wins by keeping all his nobles! Arthur's army starts the game with a morale of 8 - they are confident and strong. He knows the Saxons are on the move, and has called out the levy. He knows the Saxons want to capture a noble and chisel some money out of him, so the sooner his patrol gets back the happier he will be. Aelle's army has a morale of 6. Although his army has more, better quality troops, they are uneasy - he needs a win, not only for the money, but to bolster his men's morale. 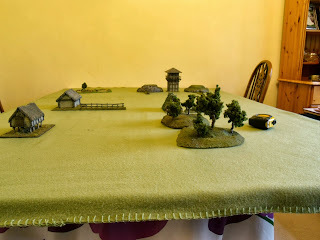 Here's the table, set up, with the terrain pieces on. I could do with some more, especially bits like fields and such like. Arthur's tactics are to rendesvous with his patrol and get his whole army back to the safety of the tower as quickly as possible. Aelle's tactics are to close with the British patrol as soon as he can, before Arthur catches up with him. He knows his army will be split and doesn't want Arthur to beat him piecemeal. Bedwyr drew the short straw and entered the table with the two units of warriors. He managed to move precisely seven inches, and dribbled up towards the tower. The dice roll brought Aelle onto the table with his champion, his two units of elite hearthguard and his archers. This could be very bad if they catch Bedwyr... Among Bedwyr's problems is that there isn't much terrain nearby he can use to shelter or anchor his flanks on. He fancies the barn and fence, if he can beat Aelle there. Turn one brings the rest of the Saxons onto the table. One formation of two groups of warriors under Sigeberht follows Aelle, forcing their way through the woods. Sigeberht plays Bounding Move to make sure he is hot on Bedwyr's heels! The rest, under Cenric, head for the middle of the table. Arthorius forms the three groups of levy into a formation, and go as fast as they can to help Bedwyr. 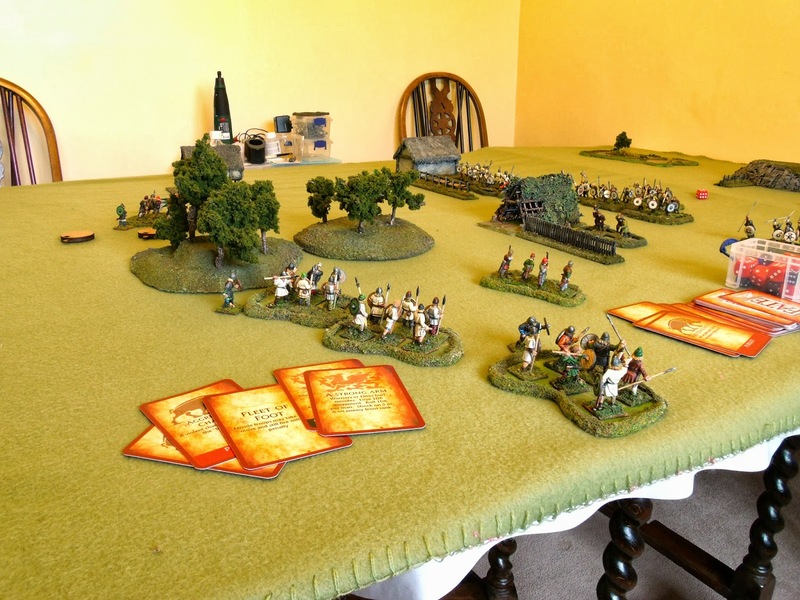 The Saxon archers and British slingers do their own thing, heading to the middle of the table. 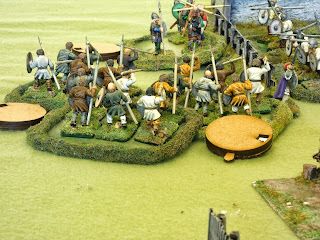 Cei takes the elite British through the gap, to try to flank the Saxons. Starting to look like a fight! Now it gets heavy. Aelle plays Carpe Diem, with Aggressive Charge, Strong Arm and (another) Bounding Move to hammer Bedwyr. Bedwyr plays Shieldwall Braced in the hope of resisting the Saxon rush, and manages to - barely. The combat continues without anything decisive happening. Both sides lose a couple of men, Bedwyr is wounded (but morale survives!) and both sides stay shield to shield. Arthorius attacks Sigebehrt with the levy in shieldwall, playing Hero of the Age. 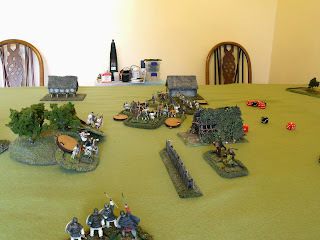 The Saxons lose a lot of men and are forced back to the edge of wooded hills. Cei attacks Cenric. 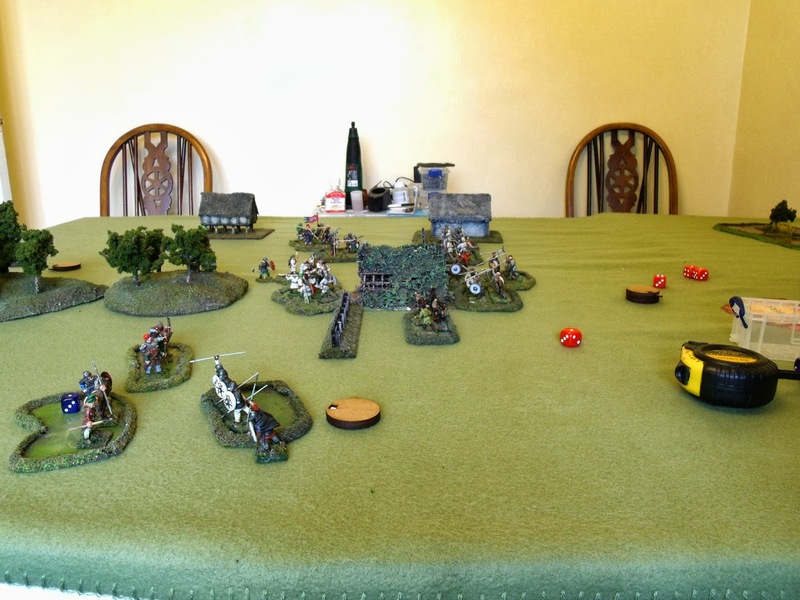 Cenric is killed and his unit flees. Saxon morale drops to 1! Cei attacks and disperses the Saxon archers. Bedwyr attacks, and kills several of the Saxon elite, including Aelle's champion. However, Bedwyr dies. British morale plummets to 5! Sigebehrt retreats into the woods. Arthorius swings the levy into Aelle's flank. He plays Carpe Diem (he doesn't have any other useful cards, but wants the flank attack effect). The Saxon elite collapse, with a couple dying and the rest breaking. The loss of this group shatters Saxon morale and they all flee. Here's a closeup of the Saxon collapse, and Arthorius relieving the warriors. Arthorius won. A tot up and consulting the raid table gives him a three point victory. He would gain a thief's horde in plunder recovered from the battlefield, and replaces his (moderate) losses in a month. Aelle's moderate losses will take him two months to recover. The game ran easily, and I didn't have any headscratches over the rules. It might be that I missed one or two things, but never mind! The game took about 90 minutes, including setup. The deck-driven activation worked well, and the Fate deck makes things happen quickly - sometimes very quickly! A few observations - shieldwall was incredibly useful - ignoring the first kill on a group makes a MASSIVE difference. Missile troops were useless, neither set achieved anything, not even inflicting a single point of shock between them! The morale table is a killer. The main thing that lost this for Aelle was some lousy luck on the morale table rolls he made. Better luck with this, and worse luck for Arthorius, might have seen a different result. I'm definitely up for another go! I love this game. Great to see another campaign in the making. 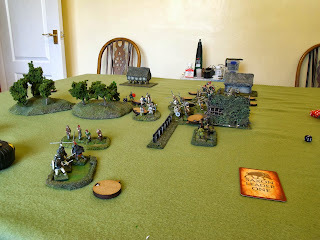 getting more and more intrigued by DuxBrit but do you need alot of terrain available for the different scenarios? Three big bits, plus four little bits, then the gubbins for the particular scenario, like farm, church, tower etc. You can use odd buildings or bits of fence as the small terrain pieces. I guess it IS terrain-heavy, but a lot of the terrain will be generic (woods, hills, fields etc) and can give service on other games! Great looking battle, I'm glad to hear that Dux Brit is good solo. I've had my eye on it for awhile. Great AAR Mitch. As I said don't start to think archers are useless. Every now and then they become the deadliest troops of them all.